(St. Louis, MO, March 27, 2019) Boys & Girls Clubs of Greater St. Louis celebrated the “topping out” of structural steel on the $12.4 million Teen Center of Excellence in Ferguson. 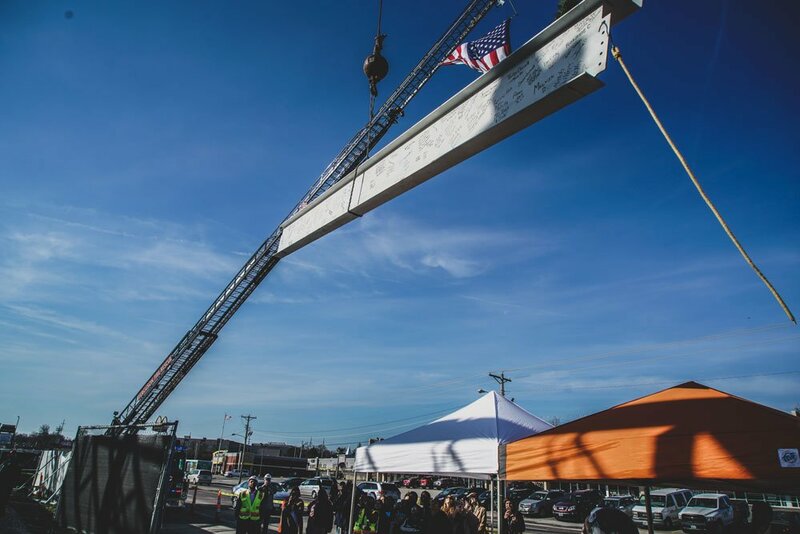 This morning, cranes hoisted a steel beam, topped with an American flag, evergreen tree and bearing the signatures of donors, community partners, board members, Club members, employees and construction workers, to the top of the building. The City of Ferguson and its Fire Department showed their support for the project by flying a large American flag from their ladder truck during the event. “The Boys & Girls Clubs of Greater St. Louis is excited to reach this milestone regarding the construction of our Teen Center of Excellence. The topping off ceremony gives us a chance to include our Club members and supporters in this important community resource. It symbolizes the role and responsibility we all have to foster hope and opportunity for all children,” said Dr. Flint Fowler, President of Boys & Girls Clubs of Greater St. Louis. According to KAI Senior Project Manager Jeremy Lammers, construction of the $12.4 million facility is on track to open in the Fall of 2019. The Boys & Girls Clubs of Greater St. Louis, in partnership with The Striler Group, KAI Build and Arcturis, broke ground on a $12.4 M Teen Center of Excellence in Ferguson, Missouri mid-September 2018. The center will offer afterschool and summer programs to teens and youth (ages 12-18) in the North County area. The Teen Center of Excellence, one of the first in the country, is being built on the site of the former Ferguson Ponderosa, will be 26,856 square feet, have three levels and include a nutrition education center, outdoor garden, gym, intellectual commons, teen lounge, auditorium, outdoor basketball and activity court, music and art studio, office space and maker space. To watch a video of the topping out ceremony and browse photos from the event, here. The mission of the Boys & Girls Clubs of Greater St. Louis (BGCSTL) is to inspire and enable all young people, especially those who need us most, to realize their full potential as productive, responsible and caring citizens. For over 50 years, BGCSTL has been providing after-school, teen, sports and summer programs to youth in the St. Louis area while also providing a safe place for them to learn and grow. The Clubs now serve St. Louis youth at ten locations (Adams Park Club, Ferguson Middle School Club, Grannemann Elementary School Club, Herbert Hoover Club, Lee Hamilton Elementary School Club, O’Fallon Park Club, Riverview Gardens Club and Hazelwood Southeast Middle School Club), within two High Schools (Normandy and Roosevelt High School) and four additional elementary schools through our Mentor St. Louis Program.